Annette Thornton is a 46-year-old single mother of seven children. Sitting in the lounge room of her two-storey northern suburbs home, Annette wipes tears from her eyes and explains why she felt the need to share her story. When it comes to life, love and loss Annette has experienced more than most. Her story starts in 1985 when a kid called Todd Blieschke brushed past her at Port Pirie High School. “I just remember thinking he was so handsome,” she says. The following year, when Annette was 18, the duo ran into each other at a local nightclub, they danced to “I’ve Got You Babe” and that was it. By 1987 they were engaged. Todd began training as a pilot with the Royal Australian Air Force in Perth, while Annette began her nurses training in Port Pirie. Unfortunately the long-distance took its toll and Todd ended the relationship abruptly. “I lost all confidence in myself and saw myself as a no hoper. It crushed me,” says Annette, now 46. Annette ended up moving to Adelaide, marrying someone else and having four children. While things went well for many years, the couple grew apart and finally split in 2003. Annette was suddenly a single mother to four young children, working as as a registered nurse at the Women’s and Children’s Hospital. But a fateful decision to appear in a local paper for a story about caring professions set off a course of action Annette could never have imagined . Todd, now based in Victoria, ended up seeing the newspaper article, which mentioned that Annette was single. Not long afterwards her phone rang. “I remember it was a Monday night and this voice just said, ‘Hi, it’s Todd Blieschke’, and I was just shocked,” she says. “I think I swore. It had been almost 20 years since we’d broken up. While she admits she was guarded initially, the duo chatted for four hours – at a cost of $1600, as Todd was in the US at the time, working as an international Qantas pilot. He explained that he was separated with two daughters. “He ended up saying, ‘please forgive me and give me one more chance’. It was just like nothing had changed – I still felt like he was the love of my life. The couple finally met up in Sydney several months later. Eventually, Todd moved to Adelaide to live with Annette and her children. Before long, Annette was pregnant with their first child. Oskar, now nine, is the spitting image of his dad. The couple ended up having two more boys with the arrival of Jack, now eight, and Finn, seven. 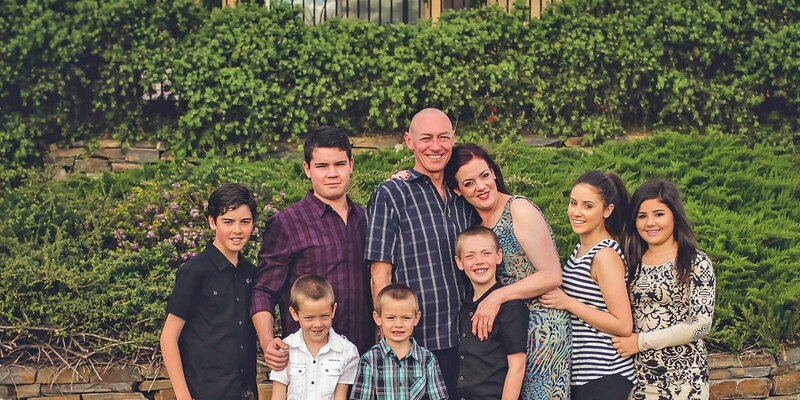 With ex-partners and nine children between them, Annette admits the couple definitely brought “baggage” to their blended family, but finally they were happy, together. The couple had been together for eight years when the happiness was shattered by heart-breaking news – Annette’s father was diagnosed with cancer. As a nurse, she cared for him and was with him when he passed away. Then, six months later Todd began to develop a persistent cough. “I kept saying you should go to the doctor and he’d say, ‘no I’ll be fine, I’ll ride it out,” Annette says. “He went to London for work and when I picked him up from the airport he couldn’t even get a sentence out because he was having trouble breathing, he still had the cough and he could barely put his suitcase in the back of the car. I’d never seen him like that before. Doctors ended up drained two litres of fluid from Todd’s left lung – he was admitted for tests and was there for a week. The usually fit, non-smoker went downhill at home and was re-admitted for further test. Further tests revealed the cancer had already spread to Todd’s bones and brain. The endless rounds of chemotherapy began. Todd suffered agonising pain and would crouch in a ball at home to try to alleviate it, never one to complain. “We just told the kids that daddy is sick and has cancer like Pop. They never said much,” Annette says. Ten months later, just after Todd’s 49th birthday, he deteriorated. “It was the morning of Friday 13, he hadn’t slept all night because of the pain and finally he said to me ‘I’ve got no feeling from my waist down’. As it turns out the cancer was growing out of the bone in the spine,” Annette says. He was taken to Calvary Hospital and then admitted to Mary Potter Hospice, “God’s waiting area” as Todd called it. “I was still saying you’ll get better – as a wife I thought he would, but as a nurse I knew he didn’t stand a hope,” says Annette. “This day he called me and said, ‘Annette come quickly’. “I finally got there and he said, ‘I’m throwing the towel in, I’m never going to go through a night like that again where I couldn’t get any oxygen in my lungs, it’s time’. I said, ‘you can’t go because we need you and you are my son’s father… but he said, ‘it’s time’. “I said, I’m coming with you – I want to be with you, I’ve always wanted to be with you’, but he said ‘you need to be there for all your children, for our little boys’. At that point Todd’s system shut down. “I was with him at the end and I was holding his hand with my head on his tummy and I said I love you Todd, I love you – I know he could hear me – and then he died. I saw him take his last breath,” Annette says, tears flowing down her face. That was more than 12 months ago – Finn was five, Jack was six and Oskar was seven. One of their favourite things today is playing in the backyard pool Todd had installed not long before his death: “He wanted to leave them something to have fun with,” says Annette. As a single mother of seven children Annette admits life is hard and she struggles to cope with crippling grief. Some days it’s hard to get out of bed – but she has to keep going for her children. Nicholas, now 22, Alexandra, 20, Isabella, 16 and Thomas, 14, plus Oskar, Jack and Finn. “I just miss him. I miss Todd so much and there are so many memories in this house,” she says, picking up the model aeroplane Todd was making just weeks before his death. He loved model making – Annette can’t bring herself to move any of his things. “Finn tells me often that he dreams of his dad and he gives me messages from Todd. He says, ‘Dad was standing next to the piano last night and he said you don’t need to cry anymore, Mum. That it’s time for you to be happy – you can be sad but don’t cry tears anymore. He told me to tell you that’. Or he’ll say, ‘dad said we’ve been good boys for mum’. “Oskar says he dreams of being in a plane with his dad and Todd looks at him and smiles. Oskar often says, “I miss my dad all the time”. Through her work as a neo-natal nurse, Annette deals with life and death every day – but none of it makes her own agonising grief any easier to cope with.